Who wants simple when you can have THIS! Absolutely darling! It's fab, really! Love all the sweet doo-dads. This is gorgeous! So lovely - great colour. Perfect combo of color, pattern and detail. Brilliant! 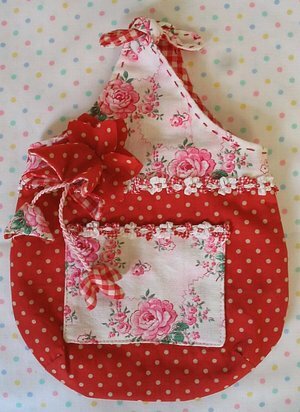 The red polka-dotted fabric is wonderful! And I love the hand stitches around the opening! I love it! I think that if you had a hundred people make the bag they would each have their own style reflected. it makes a great "blank canvas". I love all your flowery things. They seem so light and happy. everyone can always use a little bit of that! Oh, it's just too pretty for words. It reminds me of strawberry shortcake - maybe it's the red and white polkadotted thing you've got happening. So sweet! Such a great bag. Fabric, Trim, workmanship just wonderful! speaking of Sobranie cigs, just what flavor IS pink? I was always more of a Marlboro light, red bandana kinda girl, but that little bag does something to me. Thanks for your post...Monkey's up over at wishthimble. What's the collective noun for Monkeys...cos I want to make more! Is it a troop of monkeys? delisious. Simple is a bad thing, don't you worry, honey.